Have you heard of World Book Night? (Not day, NIGHT! NIGHT!) It’s a scheme to give free books to people and hopefully get more people reading. 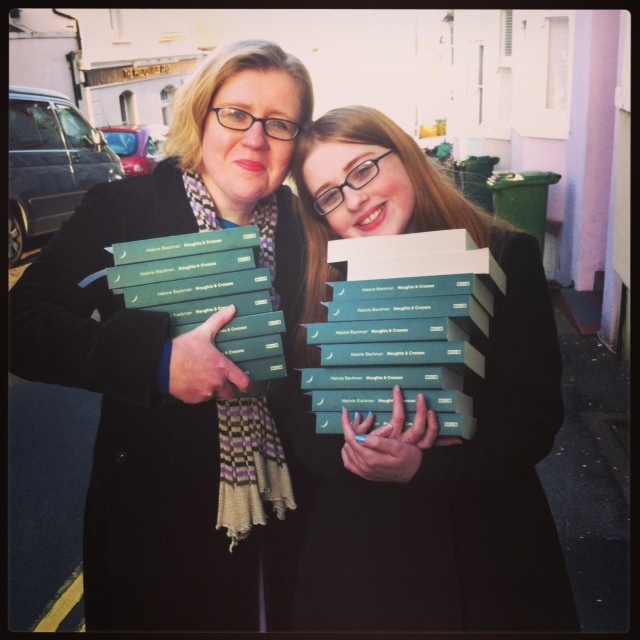 Volunteers get to choose a book from a shortlist, then they get 20 copies to give away. El and Jae applied to be a World Book Night giver and were superchuffed to be accepted (last year Jae was not accepted – must’ve been on the naughty list). Jae would like it to be known that she turned down a free trip to Disneyland Paris in order to be here for World Book Night. That is commitment. Tonight we are giving the books away! Perhaps you are reading this because we gave you a book? Here is a little bit of background about where the books have been before. We picked them up on Saturday from Waterstones in Brighton. El loves this shop (understatement). It is her dream job to work there one day, though she may not realise that you have to do more than just read the books when you work in a bookshop. 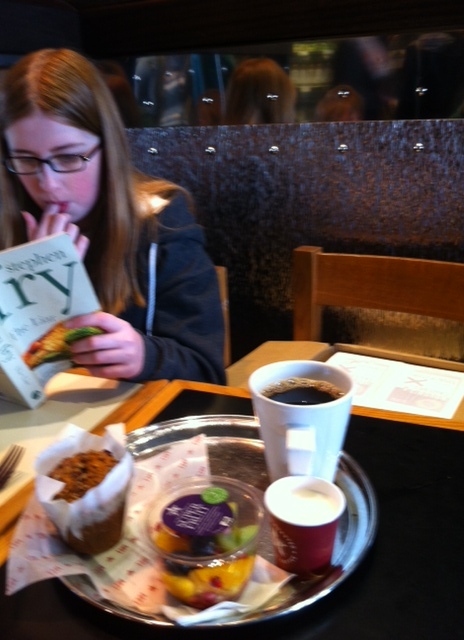 The first person we spoke to in Waterstones didn’t know about World Book Night! Quelle horreur! Luckily the second person did, and said our books were in the “special cupboard”. We are very excited about this – perhaps this special cupboard leads to Narnia, the Mines of Moria or Hogwarts Common Room. 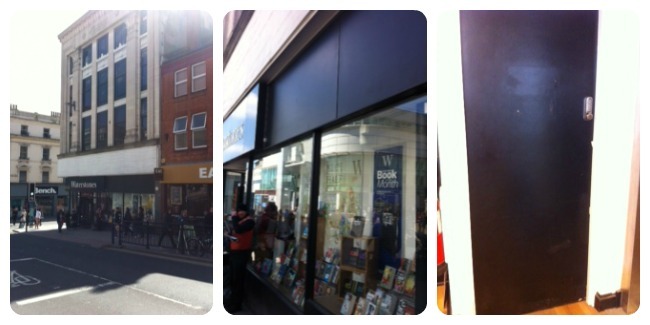 Here is Brighton Waterstones, complete with Special Cupboard: Then we took our box of books to a cafe. As you can see El was supervising them very closely. 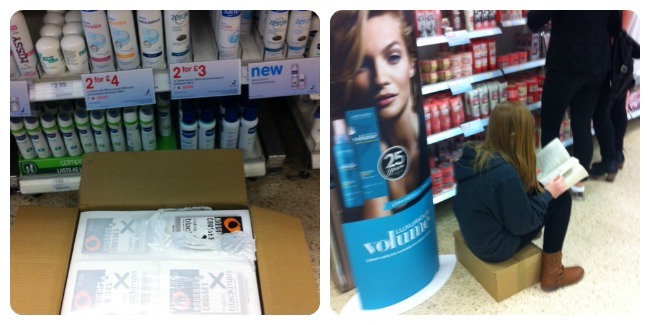 We took the books to Boots to buy deodorant. Actually, the books smelled fine but Jae gets sweaty (joking Jae). Again, El supervised the box of books, this time by sitting on them: As it was a heavy box we had to take it home on the bus. We let the box sit on the disabled seat as no one else was using it, plus a box is not able to walk. We also let the books have a little sit down on a bench cos they were tired. And it had another little sit down on the bus stop because El had bumped into her friend. So you can see that if we gave you a book, it has been on quite a journey. Treat it well, like a baby kitten or a precious jewel. Now we are going out to give away our books. We will report back later and let you know how we got on. Jae almost lost a finger on one or two letterboxes and narrowly avoided being arrested as a weirdy stalker-type person. We put some through letterboxes of people we know and the rest in random houses. All in all it was really good fun. 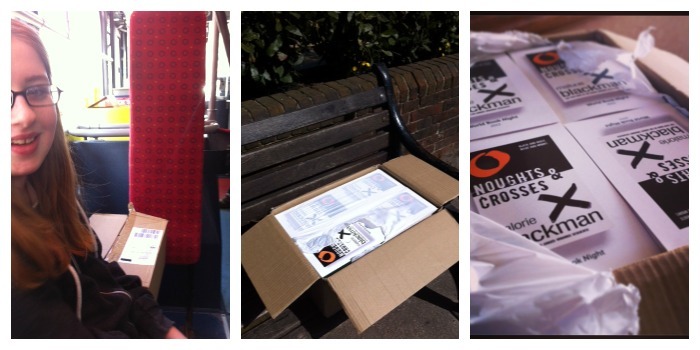 We also put a few in the doors of a cafe, a church hall and some flats (so they will have to fight for who gets it!). So if you get a chance to be a World Book Night giver, go for it. And if not – at least we’ve always got reading! April 23, 2013. Tags: reading, world book night. Stuff we love.